On February 14th RRC hosted an Anxiety Forum featuring local Clinical Psychologist, Dr. Jason Ediger. Thanks to the eTV crew, we have a recording available here. Deaf and Hard of Hearing Services provided ASL interpretation, which is also featured in the recording. Dr. Ediger spoke about Anxiety in a college context and helped us understand worry, panic attacks, performance anxiety, social fears, and more. He provided helpful tips and introduced coping techniques that so many can benefit from. Additional thanks to the Manitoba Psychological Society and Dr. Ediger for offering this public education at RRC. If you think the services of a Psychologist could help you reach your goals, you’ll be pleased to know that these services are covered under RRC’s Student and Employee Benefit plans. You can use an online directory to find a Psychologist near you. Further information and resources about anxiety can be found at the Anxiety Disorders Association of Manitoba. Each forum will include a talk by a prominent Psychologist as well as audience Q & A. Free pizza lunch is provided during both forums! According to the Anxiety Disorders Association of Manitoba (ADAM), everyone experiences anxiety from time to time. It’s completely normal and can even be helpful. For example, if you’re anxious about an upcoming test, your anxiety can motivate you to study well. However, anxiety can sometimes become severe and negatively affect your life. If your anxiety has reached this point, you may have an anxiety disorder. Here at RRC we see many students who are experiencing problems with anxiety. These problems affect academic success and overall well-being. 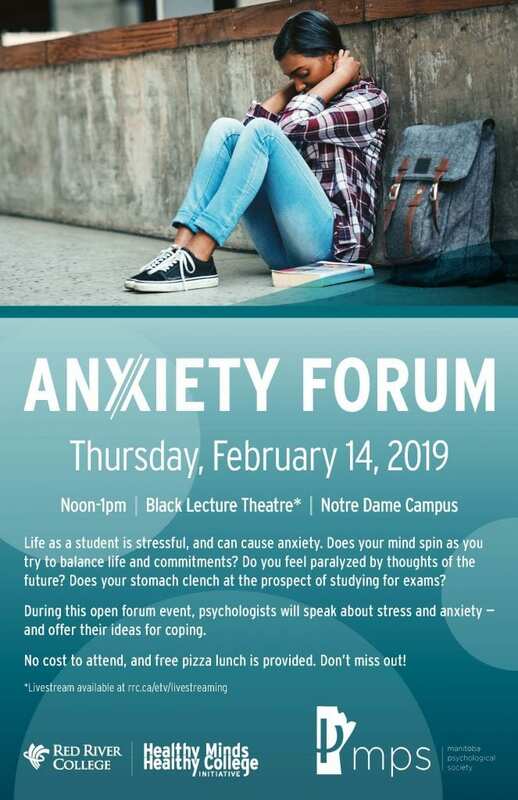 During the two forums, the speakers will share helpful coping strategies related to managing anxiety in a College setting. Although the primary target audience is students, staff and faculty will no doubt benefit from the material presented and discussion to follow. The NDC forum will also be recorded and streamed by eTV for the benefit of regional campuses. Click on the ‘Live Stream’ image to play. No username or password is required. The stream will go live shortly before the presentation begins. During the live presentation, you are encouraged to ask questions or add comments. To do so, please click on the “word bubble” icon found on the bottom right of the player. Please include your name, email address (if you require a follow-up response), and a subject heading. Note: You can also use the “word bubble” to report any technical issues. Dr. Jason Ediger, C. Psych. Dr. Ediger has a special interest in blending cognitive behaviour therapy with mindfulness based approaches to change and coping. His practice focuses on anxiety, mood difficulties, chronic pain and health concerns in adults and adolescents. He has extensive experience with disability claims and return to work issues. Read his full bio here. Dr. Elizabeth Hebert is a psychologist in the Department of Clinical Health Psychology and an assistant professor at the University of Manitoba. She received her Ph.D. in Clinical Psychology at Concordia University in Montreal, Quebec. Her research focuses on anxiety and worry and the factors that drive them, including difficulty tolerating uncertainty in daily life. Dr. Hebert is the psychologist for the Shared Care Program in Winnipeg. Her clinical work focuses on primary care settings, and includes evidence-based psychological treatments for anxiety, mood, and ADHD; psychodiagnostic and cognitive assessments; and interdisciplinary consultation. 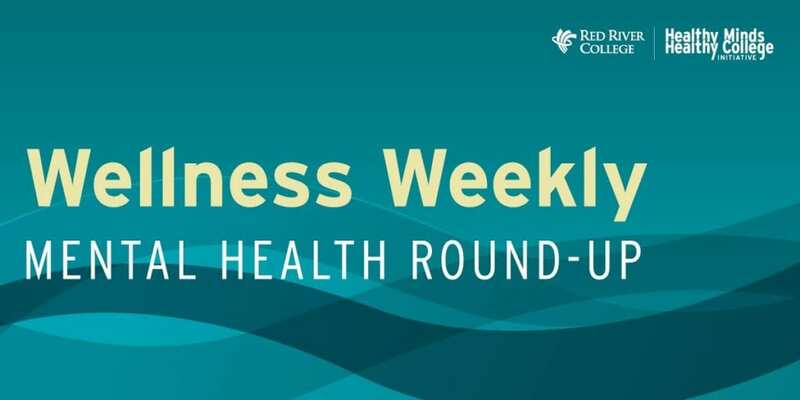 In our Wellness Weekly, mental health roundup feature we curate some of the best writing on the web related to health and wellbeing. Here is some recommended reading for this week. On Psychology Today, David DiSalvo writes about sleep’s connections with learning, emotion regulation, and anxiety. He presents evidence that disrupted sleep derails the brain’s normal cycle, affecting memory, the nervous and immune systems, and more. He also informs readers that “sleep therapy” could be an effective method of treating anxiety disorders and goes on to give some tips for recovering from sleep loss. Read Understanding the Connection Between Sleep and Anxiety. Over at NPR, Maanvi Singh writes about some of the benefits of expressing gratitude. She summarizes many different forms of gratitude, including writing thank you letters and keeping a gratitude journal. In addition to the noted benefits, Singh also highlights what gratitude can’t do and some gaps in the research. For a richer understanding of gratitude and perhaps some ideas to apply personally, read If You Feel Thankful, Write it Down. It’s Good For Your Health. On the Harvard Business Review, Shawn Achor and Michelle Gielan explore the now ubiquitous topic of resilience. They argue against what they call a “militaristic, ‘tough’ approach to resilience and grit.” Instead, they outline evidence that rest periods are the key to resilience and eventual success. Rest from work and from screens, in fact, is key to reducing accidents and other health and safety problems. They assert that the “key to resilience is trying really hard, then stopping, recovering, and then trying again.” Find this interesting? Read Resilience is About How You Recharge, Not How You Endure. Do you have some favorite reading you’d like featured? Contact Breanna. Curious about how you can use music to manage stress and improve your mental health? 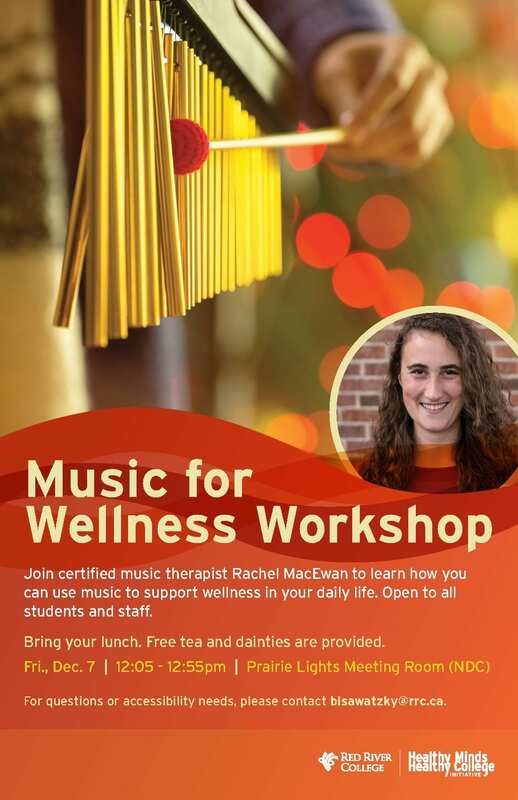 Join certified music therapist Rachel MacEwan for a Music for Wellness workshop and try out some wellness enhancing strategies, using music. Bring your lunch. Free dainties and tea will be provided. All staff and students are invited. Guiding us through different aspects of music therapy, Rachel will invite us to listen to music, make music, and analyze lyrics, all to promote good health while relieving stress and anxiety. Come on out and give it a try! For questions or accessibility needs, please contact Breanna. Whit Honea writes about the role of fathers in opening conversations about mental health. In this Washington Post article, Whit argues that “dads are shaping modern conversations about masculinity and men’s mental health”, and that doing so challenges the definition of masculinity as “detached stoicism.” Read Why Fathers Must Talk About their Mental Health. Dr. Christine Carter, Sociologist and author writes about the effects of being surrounded by interpersonal drama. She argues that “the 24/7 drama isn’t pointing us towards meaningful lives. And it keeps us from the stillness and reflection and deep conversation that make our lives meaningful.” Dr. Carter also outlines the three typical roles in a conflict (victim, persecutor, rescuer) and presents three tips to avoid taking on these dysfunctional roles. Check out, How to Ditch the Drama in Your Relationships. Have you ever interacted with a new person and left with the impression that they didn’t like you? Perhaps you felt you didn’t present yourself well. Or that the other person was being highly critical. Dr. Alice Walton writes in Forbes about some new research around the “liking gap”; a phenomenon were people almost always feel that their conversation mate’s opinion of them is lower that it actually is. Read, People Like You More Than You Think. Movies for Mental Health: You’re Invited! 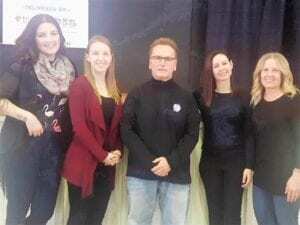 Red River College is hosting a FREE event called “Movies for Mental Health,” an interactive workshop run by a non-profit called Art With Impact that uses the emotional power of short film to initiate dialogue with students on the topic of mental health. This peer-to-peer learning event is two hours long and consists of pizza lunch, a facilitated discussion, three short films from Art With Impact’s library , and a resource panel with campus and community services. Join us in creating a healthy environment at RRC through dialogue and growth! Wednesday, October 3rd, 11am – 1pm in The Cave Lounge at NDC. Free pizza lunch for all who attend! 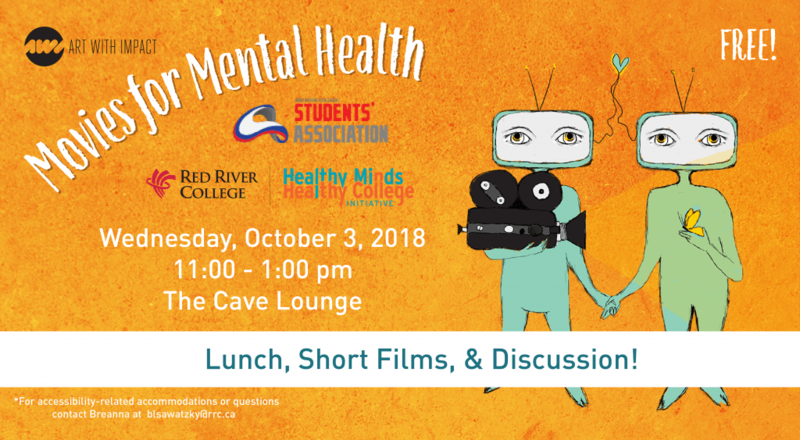 This event is sponsored by the Healthy Minds Healthy College Initiative and RRC Students’ Association as we observe Mental Illness Awareness Week. All students and staff are welcome. Don’t forget to #GETLOUD for Mental Health Week. Mental Health Commission of Canada Statement on Mental Health Week. In her statement, Louise Bradley (President and CEO, Mental Health Commission of Canada) encourages Canadians to monitor their mental state with the same interest they devote to managing their blood-pressure or any other physical concern. She also draws a link between public services like education and childcare and good mental health. The Difference Between Social Anxiety and Introversion, In 4 Comics. In this article Lindsay Holmes and Eva Hill outline how the personality characteristic of introversion differs from the clinical condition called Social Anxiety Disorder. They use illustrated comics to demonstrate these differences. How Physical Fitness can Boost Your Career. Here Ivan Ho makes the case for developing good exercise related habits, encouraging readers to put health first. He ties physical activity with mental clarity, improved energy, and increased ability to meet work demands. Did You Miss Craig Heisinger? Watch the recording! Earlier this month, RRC welcomed Winnipeg Jets exec Craig Heisinger (Zinger) to give a mental health awareness talk. If you missed it, you’re invited to watch the recording here. Zinger spoke about his relationship with Rick Rypien who, while struggling with poor mental health, played parts of six seasons with the Manitoba Moose and Vancouver Canucks. After Rick’s death by suicide, Zinger and the True North Foundation started Project 11 to help students learn skills to build strong, positive mental health. Zinger now speaks at many schools each year, highlighting the importance of mental health and support. His talk at RRC was both informative and heartfelt. on Twitter, check out #ZingerAtRRC to see some of the statements that resonated with those in attendance. RRC is committed to keeping the mental health conversation going so that every member of our community knows they are not alone and that it’s okay to reach out for support. A great way to stay informed of future events is to subscribe to this blog. A huge thanks goes out to the RRC Students’ Association for supplying the pizza lunch and to the eTV crew for recording and livestreaming. Prize winners will be announced in a subsequent blog post. Each forum will include a talk by a prominent Psychologist as well as Q & A with the audience. Free pizza lunch is provided during both forums! Here at RRC, Counselling and Accessibility is works with many students who are experiencing problems with anxiety. These problems affect academic success and overall well-being. Dr. Gillian Alcolado, C. Psych. Dr. Gillian Alcolado is a registered clinical psychologist working at the Anxiety Disorders Clinic at St. Boniface Hospital. She is also an assistant professor in the Department of Clinical Health Psychology at the University of Manitoba. She completed her PhD in clinical psychology from Concordia University in Montreal and her residency at St. Joseph’s Healthcare in Hamilton, where she completed a major rotation in their Anxiety Disorders Treatment and Research Centre. Her research interests include the etiology, maintenance, and treatment of anxiety and related conditions. Breanna Sawatzky, Mental Health Coordinator, is happy to come speak briefly to classes in order to promote awareness of these events. Contact her at 204-632-2061 or blsawatzky@rrc.ca to set up a time. The following is a guest blog post by Austin Day, current RRC Photography student. 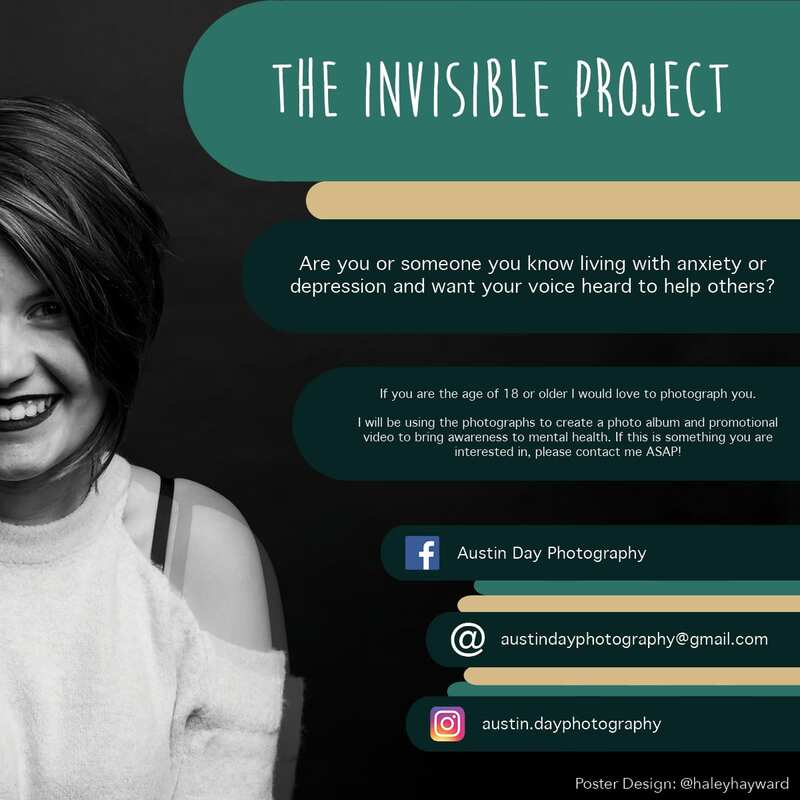 I am in the process of creating “The Invisible Project.” It is a collection of photographs of people who are currently living with anxiety and/or depression. From the photographs, I will be putting together a photo album and promotional video for mental health awareness. Those who participate in the project may come back to do a video interview on their experience. My own personal experiences inspired me to start this project. Close to 4 years ago I was diagnosed with type 2 Diabetes. I was very ill and spent a few days in the hospital. It was a life altering experience that flipped my whole world upside down. Fast forwarding a year after my diagnosis I started experiencing a lot of anxiety and panic attacks. I was also experiencing burnout from my diabetes. Due to my anxiety, I was unable to cope at my job. I hibernated in my home for a long time. Though my mental state has improved immensely and my diabetes is well under control, I still worry about my health and wellbeing all the time. My goals for this video is to bring awareness to mental health. I want to provide people with an opportunity to use their voice to share their stories with others. I am calling it The Invisible Project because quite often mental illness is not recognizable on the outside. I will use photography as a tool to show people how the world perceives them compared to how they see themselves. Everyone has their own unique beauty and I’m here to showcase that.